Hydrophilic Personal Catheter is a Closed System Catheter by Rochester Medical. Packaged with its own sterile water packet, the all-silicone Hydrophilic Personal Catheter provides virtually friction-free insertion and removal. Its innovative packaging makes it quick and easy to prep while maintaining sterility in any setting. The Hydrophilic Personal Catheter is available in a sterile, single unit package as well as in a closed system that offers catheterization without having to touch any part of the actual catheter. 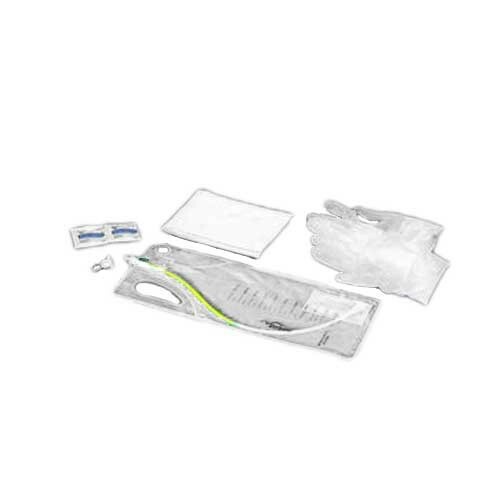 The catheter tubing is an integral part of the urine collection bag. The catheter provides enough firmness for comfortable, easy catheter movement, yet gentle handling characteristics minimize trauma that can occur with stiffer catheters. These catheters require a prescription. Sterile water packet, packaged inside an 1,100-mL collection bag. Silicone design with hydrophilic coating for easy insertion and removal. Packaged with its own sterile water to avoid contamination from tap water. Catheter Product Numbers: 63712, 63714. Size Options: 12 or 14 French. Four comfort-sized drainage eyes and secure grip section.